You’re invited to Sweet Earth’s 4th annual Bead-a-thon during Sycamore’s Spring Break. Bead-a-thon is a week long event with over 25 classes that teach the many aspects of creating jewelry. This year’s theme is GOTTA BEAD because sometimes you just have to bead! Classes will be held several times during the day and evenings, Friday, March 22 through Saturday March 30. If you have always wanted to learn to make jewelry, refresh your skills or see the latest techniques please join us. This year we have an added a fun bonus-one entire day set aside from classes for shopping! On Tuesday, March 26, customers will receive a Double Green Bag discount on all purchases. That’s 20% OFF on everything in our store with a Sweet Earth Green Bag*. We are proud to introduce a new selection of Japanese, (Miyuki) Seed Beads. The hottest colors in Delicas, Tila, Square, Magatama, and 3 of see beads-sizes 6, 8, and 11.. We will have the largest collection in the area! Tuesday will be a great day to sample these new beads. As always during Bead-a-thon we will have a huge trunk show offering new beads at fantastic prices! Save even more on with your Sweet Earth Green Bag. 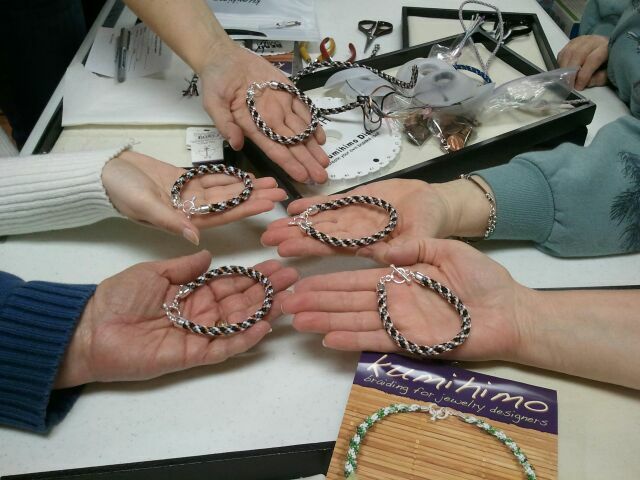 Starting Friday, March 22 we kick off our classes by teaching Japanese Braiding-the art of Kumihimo, an easy and fun way to make decorative jewelry cords. All ages can learn how to make these colorful braids that can be used for necklaces or bracelets. Later in the week our Kimihimo in-house expert, Lori will be teaching an advanced Kimihimo with beads class. The finished beaded bracelet is beautiful. Weaving type jewelry making is hot. We will be teaching how to create a Shamballa bracelet using gemstones. On two different days we will teach students how to make a bracelet using parachute cord in local school colors, black & gold, orange & black and orange & blue. Please go to www.sweetearthjewelry.com for a complete list with project pictures. This year we are introducing new classes in metals-Wire Wrapping and Chain Maille with a new instructor, Jen Wallis, a graduate of our own Kiswaukee College Arts program. Jen will be teaching students how to use wire to wrap gemstones artistically. Later in the week she will teach the techniques of using jump rings and beads to create beautiful jewelry called Chain Maille. The jump rings are linked together to form a chain. Our very popular Chakra Class is back. This year students will make a pendant using gemstone beads representing the Chakras or energy centers within our bodies and then finish the piece with a silver spiral wire wrap. Once again we are happy to include our neighbors on State Street, Glass Gardens Inc in this year’s Bead-a-thon. On Saturday March 23 & March 30, owner, Christy Klein will offer a special glass fusing class to create your own piece of glass art that can be used for jewelry. Christy teaches classes at her store and also at Kishwaukee College. Our most popular class from last year the Wine and Bead Night is back on Thursday evening, March 28th.This adult only class is a great way to wind down the week, creating jewelry while enjoying wine and conversation. This year we will continue to offer FREE daily demo’s on basics techniques. Many classes will be repeated at different times for your convenience. We have classes that will appeal to all ages: from wire wrapping, metal stamping, bead knotting to making a beaded earring and bracelet set to the hottest bead weaving techniques. Learn crimping, finishing corded or ribbon necklaces, working with memory wire, and using stretch cord for bracelets. Another reason to visit Sycamore during Spring Break is the Spring Fling event. Visit participating downtown Sycamore businesses for a chance to win one the contents of the Golden Egg filled with goodies. If you live outside Sycamore you can come for the day or stay overnight at the Jane Fargo Hotel right next door! Pre-registration is requested and prices of classes range from FREE to $50.00. Pre-registration is required on classes with fees, so we can have class kits prepared. Class fee due at time of registration. No registration necessary for FREE Demo’s. Please check out our complete class schedule www.sweetearthjewelry.com and on Facebook. Please call 815-895-3011 to register or for more information contact us at friends@sweetearthjewelry.com Call us today and reserve your space cuz sometimes you just GOTTA BEAD! Sweet Earth is open Mon-Fri 10-6, Saturdays 10-5 and Sunday 12-4. Special Hours Thursday, March 28 for our Wine & Bead Ring Night open till???? *Sweet Earth Green Bags available for purchase in our store. Go to www.sweetearthjewelry.com for all the details.